How Much Workspace Do You Need Around Your Equipment? You are here: Home » » For the Homeowner » Home Maintenance-Consumer Info » How Much Workspace Do You Need Around Your Equipment? There is a struggle for space in your attic, outside of your home, the utility room, and the garage. It may not seem important to you now, but not having enough workspace can make jobs more difficult. Have you ever squeezed into a cramp space to work on a mechanical system? For example, crawled under your car to work on the engine. Oil is falling into your face, and your knuckles are being torn up. We jack the car higher, but they does not really help. You end up taking the car to the mechanic, and he places the car on the hydraulic lift, or he has that basement like space in the bay. Imagine how long it would take him without that space. Do you think it will effect the price of the repair? You can see this happening with the car, but this happens with mechanical equipment in your home too. Workspace is important. Once on a home inspection, I saw that the previous report had been left in a cabinet that I was looking in to check the plumbing. This report was from several years earlier, so I thought things would have changed; no point in reading it. I did look through the pages to see how it was written. What I came to realize is that not every inspector considered the idea of workspace as an issue of concern. In this home, the water heater was in the attic. The attic framing made the inspection difficult, so I knew working on the unit would not be easy. Labor costs would go up, since the repair man would be slowed by the objects in his way. I reported it. Certain homes have more problems with the aspect of space. We landscape around exterior service panels (breaker boxes) and compressors. Often these new plants cause space issues. In the photo above, a room was added to the attic. 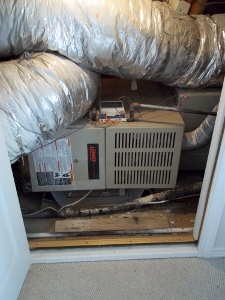 The builder had the air conditioning equipment situated. For one unit, the decision was made to place it in a small space created by the new room wall and roof line. To access the equipment a door was in front of the burner compartment. A space of about one foot wide was open to access the equipment. To work on the burner, the workman does have enough space, but you would want him to take the precaution of placing down a mat. The evaporator coil would be harder. Everything was working fine, and you may be hard pressed to think about when it breaks down. A home inspector should tell you. How much space do you need for working? You need enough space in front of the unit to position yourself; three feet is good. You need enough space to each side and above to move around in and to move pieces out. Think about the movement of your arms when reaching to the side or the top. The harder concept is imagining how things evolve. How big will the trunk of the tree become? How big will that bush be? How will the equipment be moved out? These are things that we should consider when planning out landscaping, but we have to consider this when making changes to the home. I had a weird situation when a homeowner closed off the original entrance to the attic. A new entrance was created on the other side of the home. The path to the equipment in the attic was not smooth. I noticed that remodels plan out the new objective, like a new room, but forget what might be there, and its needs. Of course no one wants to think of major issues happening to their home. However, you may want to consider the consequences if people work on that equipment. This entry was posted on Friday, February 4th, 2011 at 4:00 pm	and is filed under Home Maintenance-Consumer Info. You can follow any responses to this entry through the RSS 2.0 feed.